KIEV, Ukraine -- Thousand of Ukrainians have been displaced by fighting in the country's east. Some have found a safe harbor amid ex-President Yanukovych's sprawling, palatial estate. A protester wearing an EU flag stands at Ukrainian President Yanukovych's countryside residence in Mezhyhirya, near Kiev, Ukraine, in February. The former president's estate has become a home for dozens of refugee families who have been fleeing the fighting in eastern Ukraine. Three weeks ago, Yelena turned up at the bus station in Konstantinovka, desperate to find a way to get her family of five out of the rebel-held eastern Ukrainian city. When she walked into the hall of the bus station, she saw dozens of families clutching their belongings, children and grandparents, all of them trying to do the same thing: Get out of eastern Ukraine. 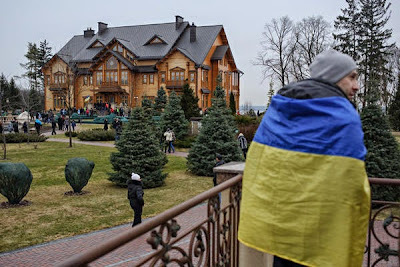 Today, Yelena and her family are now in Kiev, living in the unlikeliest of places: the staff housing on ousted President Viktor Yanukovych’s massive 340-acre estate, Mezhyhirya, which until February was off limits to average Ukrainians. Yelena (who didn't want to give her last name for fear of retaliation from the rebels) and her family are part of a growing number of internally displaced Ukrainians caught in an increasingly fragile humanitarian crisis. As the Ukrainian military steps up its offensive against heavily armed rebel groups in the east, the situation on the ground among civilians has deteriorated significantly, causing thousands to flee, according to a new United Nations report. And for dozens of other refugee families from both eastern Ukraine and Crimea, some respite can be found on the grounds of the former president’s multimillion-dollar mansion. Now, Yelena's eldest daughter runs around with other refugee children inside the estate’s gilded gates, where there is a petting zoo, miles of trails to roam, and a river embankment to ride bikes. "We haven't really had time to joke about where we are living yet," she said, looking around at the surroundings outside the entrance of the freshly painted, yellow two-story building. "But I guess it is kind of funny that they put us here." According to the latest UNHCR data, there are an estimated 34,400 internally displaced people in Ukraine, about 11,000 of those from Crimea, which was annexed by Russia in March. Some evacuees say they are escaping from constant shelling from the Ukrainian military operation, which the UN estimates has claimed 356 lives since mid-April. The Ukrainian military said last week that about 145 Ukrainian military personnel have been killed trying to root out pro-Russia rebels from the region. That figure includes 49 killed earlier this month when rebels shot down a Ukrainian military cargo plane outside of Luhansk airport. Others report that between the lawlessness and looting in the areas ruled by the separatists, and the fear of being caught in the middle of the Ukrainian military’s bombing, the situation in even the smaller cities of eastern Ukraine has become untenable. Konstantinovka, a small industrial city of about 90,000, lies about halfway between Donetsk and Slavyansk, the pro-Russia rebel stronghold where the heaviest fighting has taken place since the Ukrainian military started its campaign against the separatists. So far, Konstantinovka has been spared the heavy artillery shelling and firefights that have sent thousands fleeing from Slavyansk. But the rebels had declared Konstantinovka to be firmly under the administration of the self-proclaimed Donetsk People’s Republic, and armed men roamed the streets. Daily reports of heavy artillery and firefights just outside of the city had everyone on edge. Trains had stopped servicing the city’s station in early May. The city water stopped flowing in late May. All roads leading out of the city meant a risky passage through rebel-held block posts with jittery, armed masked men searching each vehicle. Beyond them, there were more checkpoints manned by the Ukrainian military. “All I knew for sure was that we had to get out, and I would decide the rest of the details later,” said Yelena. The Ukrainian government has scrambled to deal with the worsening humanitarian crisis in the east, while its military continues to mount pressure to try and gain control of the insurgency. President Petro Poroshenko has called for a humanitarian corridor to allow those seeking safety to get out of the areas most affected by the military’s anti-terrorist campaign. But so far, those who have left say they are relying mostly on an extensive network of volunteers to help them with everything from transport out of hot spots to host families. A volunteer group called East SOS helped Yelena find a temporary home on Yanukovych's former estate. Yanukovych's property was turned over to the state after mass protests in Kiev demanding the ouster of the former president in late February. He escaped in the middle of the night, leaving his large, riverfront estate open. The grounds, including a golf course, petting zoo, and extensive car collection, have been preserved as a park now popular for weekend excursions by ordinary Ukrainians and tourists. Several local entrepreneurs have set up a bike rental business outside the estate’s gates, where tourist pay 20 Ukrainian hryvnia, about $1.70, to enter the grounds. The service housing where Yelena lives, across the street from the estate's gate, has 20 one-room apartments. About 70 people are staying there, including Tatar families from Crimea and other eastern refugees. The units were previously used to house some of the dozens of staff required to maintain Yanukovych’s estate. Yelena's family shares a one-room accommodation with a small kitchen and bathroom. Yelena shares one of the room's two queen-size beds with her two kids, while her mother shares the other with Yelena's 12-year-old niece. Yelena said she didn't know how long she would stay in the accommodations that once belonged to Ukraine's most hated politician. With no prospects for work or permanent settlement yet, it was hard for her to think beyond tomorrow. The ordeal weighed heavily on her and other resident's minds. “For now, this is OK, people are taking care of each other,” she says. “But I don’t know what is next. I know I don’t want to return east. There, it’s just people walking around with guns and the constant appearance of war."